We all share the dream. Hitch up the caravan and head off, no rules, no regulations, no packing drill, just travel. But really, it’s all nonsense; like it or not, a little reality must flow into every dream. Despite those wild fancies, there have always been rules and we’ve always travelled better knowing them. And don’t take the scuttlebutt you hear around the camp kitchen as gospel. Nowadays, largely uniform rules and regulations face us all, so buckle up, face the front and take note. There’s every chance confusion reigns when it comes to what’s what with our speed limits. 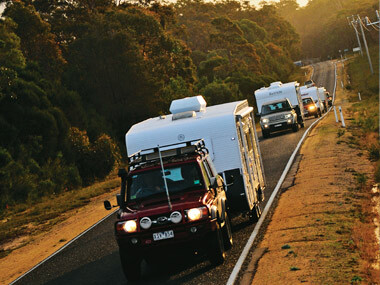 The major caravan and camping industry associations have collaborated to produce the National Caravan and Recreational Vehicle Towing Guide to help clear up much of the confusion shared by the owners of around 400,000 registered caravans, campers and tent trailers. However, a DVD recently released by Tow-Ed, a private firm offering driver education in most states and territories, is also a useful guide. The Australian Practical Guide to Towing is very worthwhile. As with any regulations, speed limits don’t commandeer the driver’s common sense. They are always maximum speeds under ideal conditions, but towing is not considered an ideal condition. Nonetheless, drivers towing caravans generally must conform to regulatory speed signs. But there are some exceptions. “NSW road rules set a maximum speed of 100km/h for a tow vehicle and caravan with a combined weight of more than 4500kg,” NSW Road Transport Authority’s Joanne Box said. As a matter of fact, this is the case nationally. According to Qld’s Department of Transport and Main Roads (DTMR), towing requires additional driving skills and safety precautions, so drivers must drive to suit the conditions. The DTMR covers its concerns in A Safe Towing Information Booklet, available on its website. WA goes beyond the national regulations. Out west, the maximum speed limit is either 100km/h or the posted limited, whichever is less – the weight of the caravan doesn’t matter. The National Transport Commission’s Australian Road Rules offer another reason to watch your speed, specifying that a vehicle (or combination) longer than 7.5m (24ft 7in) must not travel closer than 60m to another vehicle, or no closer than 200m outside of built-up areas. In terms of non-built-up areas, governments may recommend caravanners avoid towing in rough-road places like the Kimberley, but the choice is yours as long as you stay safe. The same goes for anywhere across the nation where you find roads not recommended for caravans – regardless of speed limits. In addition, the Australian Road Rules advise that if the posted limit is more than 100km/h, and the vehicle and trailer have a combined Gross Vehicle Mass of more than 5000kg, the maximum speed limit remains 100km/h. The upshot of all this is that travelling at less than 100km/h is not a bad policy. It saves lives – and fuel. When caravanning, you will often come across terms like “ATM” and “GTM”. The ATM, or Aggregate Trailer Mass, is the total mass of the laden trailer with the maximum load recommended by the manufacturer, including the load imposed on the tow vehicle. The GTM, or Gross Trailer Mass, is the ATM minus the mass supported by the tow vehicle, the ball weight. Don’t worry, it’s not quite as complicated as it seems. The important thing to remember is that the loaded caravan can’t be heavier than the recommended towing capacity of the tow vehicle, or the capacity of the tow gear fitted to the vehicle. According to Caravanning Queensland chief executive officer Ron Chapman, problems arise when heavy after-market items, such as air-conditioners and extra water tanks, are added. “People forget that these things have to be treated as ‘load’ if they are fitted after they leave the factory,” he said. “People also often forget that water and gas are part of the load and only the gas cylinder itself is usually included ex-factory. A spokesman for Tas’ Department of Infrastructure, Energy and Resources said that while formally weighing your rig is not a legal requirement in that state, RVers do have responsibilities in knowing their weights. “There is a general duty on an operator of a vehicle towing a caravan to comply with ATM and towing capacity rating of their vehicle,” he said. Martin Bennett, of the NT’s Department of Lands and Planning, agrees the onus, if not legal requirement, is on caravan owners to know their weights. “A driver of a vehicle towing a caravan is not required to visit a weigh station to weigh the vehicle combination, unless directed by a police officer or transport inspector. But weigh stations are publically accessible and it is the driver’s responsibility to ensure both the GVM and GTM of the towing and towed vehicles are not exceeded,” he said. In the end, the best way to be sure is to weigh your van. There are, no doubt, countless moments when a caravanner has found themselves having to take more space, and pot-entially a second lane, in order to turn right or left, or make a U-turn. However, encroaching onto a second lane might see you fall foul of the law. To avoid drifting into that second lane, the tip for new caravanners is to practice turns by aiming the tow vehicle to take the longest path, in the same way a semi-trailer might. But if you feel you have to use the next lane as well, there is a nationally agreed lawful solution. First, if the combination of van and tow vehicle is less than 7.5m (24ft 7in) in length, you can forget it. You can’t legally get away with using more than your lane, so one of the towing courses common in most states and territories might be best. But if your rig is longer than that you will be allowed to use more than one lane, provided you have a “Do Not Overtake Turning Vehicle” sign at the rear of the van. Displaying this sign is the only way you are allowed to turn using a second lane. Perhaps the trickiest of these are left-hand turns, because you usually have less room to turn and your vision of the corner is obviously limited. Either way, just displaying “Do Not Overtake Turning Vehicle” signs does not offer drivers the opportunity to create a hazard or turn irresponsibly. It is essential to always plan ahead, think before maneuvering and be careful to avoid danger. According to Tow-Ed’s Julie Eggenhuizen, these signs only allow straddling lanes when any part of the vehicle is within 50m of the nearest point of the intersection, it is not practical for the driver to use the left lane only, and it is safe to overlap lanes. But keeping safe doesn’t stop once in camp. It’s easy to imagine that some of the most overlooked, and arguably most important, RV safety considerations are those around fire. Extinguishers and smoke detectors are often put out of mind most of the time. Until we need them, that is. 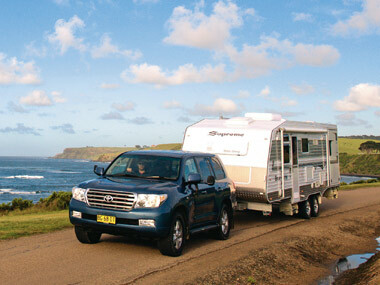 In NSW, motorhomes, campervans and caravans must be equipped with smoke detectors and fire extinguishers. Elsewhere, it’s mandatory for all caravans to have fire extinguishers. According to the Federal Department of Infrastructure, Transport, Regional Development and Local Government small trailer manufacturing code of practice, “Fire authorities strongly recommend that caravans or trailers equipped with cooking facilities, or living or sleeping accommodation, be fitted with approved fire blankets and smoke detectors.” Australian Standards also insist on fire extinguishers. In addition, the Recreational Vehicle Manufacturers Association of Australia (RVMAA) code has listed fire extinguishers and smoke detectors as compulsory for the last seven years, and all members are required to fit them.